Imagine, for a moment, a hypothetical country rapidly spiraling towards autocracy, illegally arresting American citizens, imprisoning journalists, and attacking American-supported forces. Now imagine that same country actively purchasing Russian surface-to-air missile systems and erecting missile defense sites around its territory. In such a hypothetical, it would be difficult to assume that the United States would ever support or even arm such a country. Unfortunately, this is not a hypothetical scenario. Not only is the U.S. treaty-bound to an alliance with such a country, it is actively engaged in efforts to sell fifth generation attack aircraft to it. The country in question, Turkey, and its drive toward acquiring a fleet of F-35s represents a serious threat to American national security and technological superiority. Fortunately, this threat has not been ignored by American policymakers, though more can be done to secure American aerial supremacy. Two main factors combine to make the sale of F-35s to Turkey a credible threat to American national security. First, on the immediate and kinetic front, Ankara’s continued efforts to acquire and deploy Russian-made integrated surface-to-air missile systems could give Russian engineers and radar systems operators key insight into the radar cross section and signals signature of the F-35. Second, on a broader and more strategically oriented scale, further supporting Turkey’s military advancement could backfire should the country slip further toward authoritarianism. The first of these issues has thus far garnered the most attention on the Hill, due largely to its immediacy and clear outcome. Put simply, should the Turkish Air Force operate the F-35 in the vicinity of Russian S-400 missile systems Turkey will receive in 2019, Russian engineers could gain valuable insight into the aircraft’s detectability and flight profile. This would greatly hinder American aerial superiority and could jeopardize some of the most critical capabilities of the new aircraft should conflict with Russia arise. Lawmakers were quick to recognize the signals intelligence threat posed by Turkey linking the Russian missile system to the fleet of F-35s it is scheduled to receive in 2020. Last fall, Congress put a halt on the sale of F-35s to Turkey pending a report from the Pentagon on the implications of Ankara’s acquisition of the 100 F-35s it originally planned on purchasing. That report was delivered in November and Congress has yet to formally announce its conclusions on whether or not the sale will go ahead as planned. Unfortunately, Congressional concern over Turkish F-35 acquisition might come too late to have a strong impact on Russian examination of the aircraft. Indeed, as President Erdogan continues to develop a stronger relationship with Moscow, pilots of the Turkish Air Force are training to fly American-made F-35s out of Arizona’s Luke Air Force Base. 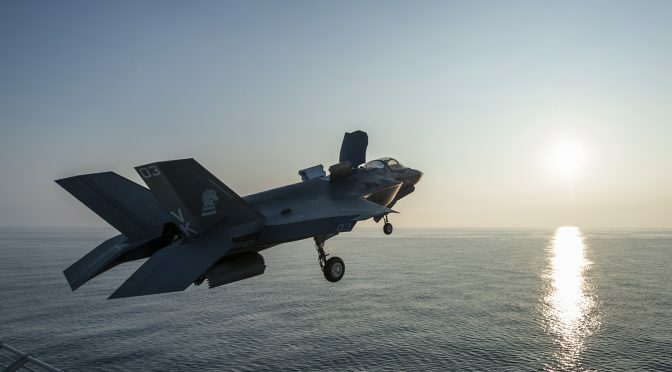 Moreover, the Turkish Air Force has already received its first F-35 and, though the plane remains in the United States, as Sebastien Roblin wrote in early September, it cannot be legally confiscated by the U.S. government. Should this specific aircraft successfully make its way to Turkey, it would likely be exposed to the prying sensors of the S-400. The problems do not stop there. Beyond the immediate concern of compromising the classified capabilities of the F-35, fifth generation fighter sales to Turkey represent a strategic and ethical threat to both the United States and the NATO alliance as a whole. In the past few years, President Erdogan has successfully solidified himself as a modern autocrat in all but name. After 2016’s failed coup attempt, Erdogan has directed the arrests of tens of thousands of political opponents, journalists, teachers, and activists. He has illegally detained American citizens and threatened American-supported forces on the ground in Syria. These hardly represent the actions of a dedicated ally and should cause grave concern for export control professionals engaged in the sale of any advanced weapons systems, let alone the F-35, to Ankara. Moreover, Erdogan has repeatedly threatened to leave the NATO alliance as a response to the growing tensions between Turkey and the United States. This comes at a time when the alliance faces increased Russian aggression on its borders and Russian interference in the political spheres of member nations. Indeed, Erdogan’s actions hardly support an image of a united alliance against Russian aggression. Rewarding such threats and rhetoric with the delivery of F-35s, regardless of Turkey’s investment in the program, is hardly a sound strategy. Indeed, as the leader of the world’s largest alliance of liberal democracies, it would behoove Washington to distance itself from Ankara’s rapid descent towards despotism. This argument is only compounded further when recognizing that not only American F-35s would be put at risk by Turkish acquisition, but the F-35 fleets of NATO allies like the UK and Norway as well. While diagnosing the risks associated with selling F-35s to Turkey is an easy task, treating them is far more difficult. Largely, this is a result of Turkey’s deep industrial involvement in the development of the aircraft. To date, ten separate Turkish firms have engaged in significant support efforts in the F-35 program ranging from the integration of the plane’s new precision-guided Stand-off Missile to direct production of the F-35s weapons bay doors. Beyond the private sector, President Erdogan has repeatedly brought up the fact that the Turkish government has spent, in total, almost a billion dollars on the procurement of F-35 airframes. Such an immense level of sunk cost and existing investment means that Ankara will not simply roll over should Congress decide to cancel the sale of further F-35s. The White House must then determine whether fraying military ties with Turkey is worth preserving its new fifth generation fighter. In light of Turkey’s increased relationship with Russia, commitment to purchasing Russian weapon systems, and rapid devolution into a modern autocracy, Washington’s best interest lies in denying the sale of further F-35 airframes to Turkey. The F-35 is critical to the future of American and NATO air superiority. It cannot be used as just another political chip on the global chessboard. Should it be sold to Turkey without Ankara’s cancellation of the S-400 deal, the F-35 could be compromised before it even takes flight as America’s primary strike fighter. I have been following CIMCEC for quite a time but this is totally embarrassment for CIMCEC. I’ll take only technical aspects of article. If a country decides to separate originator of an equipment and prevent data collection from it. Data (if any) collection it can easily be done. 1. Designer of manufacturer country workers may not get near the equipment or carry any additional tool by them to extract any data from the equipment (this time a radar). For example US companies selling EW equipment all over the world. But the manufacturer can (or at least should not) not get close to those equipment to extract data collected by these EW equipment. The same principle applies here. Physical separation always works. 2. Data dioding also possible and can easily be done if there has to be a some kind of connection (Turkey announced many times there will be none). Banks all over the world transferring billions of dollars any given second using cyber security tools. This can be done clearly without leaving doubt. 3. If USA had and have any suspicions of these radars taking all parameters of F35s in flight, and transmitting them to Moscow and this make F35 vulnerable, then I believe, F35 does not deserve to budget it consumes. On the other hand, USA should object Israel first, not to fly F35s over Syria, afraiding of radars on this country might steal F35 data. For the political perspective USA should object Greece for purchasing S300 at the first place, to be a country of principles. Since USA refused Turkish demands for air defence systems to be purchased from USA, USA lost its right to object further seek for other vendors. If a country requires a capability which is to defend itself then, ways are found. CIMSEC is a global organization and will take input from many sources. Please write your position into a formal article and submit it for publication via CIMSEC’s editorial process. This response by a Turkish writer is incomprehensible and inarticulate, and contains numerous misrepresentations. The fact is that Turkey has already violated the sanctity of North Atlantic Alliance security accords, and the US is perfectly within its rights to refuse the sale of the F-35 to Turkey. Indeed, by US law, the US absolutely cannot transfer the F-35s to Turkey because the US Defense Dept. cannot certify that Turkey has not acquired the S-400. Turkey under Erdogan has proven itself to be literally an enemy of Europe and the US. This post is wrong headed in all respects. First of all, Turkey IS a treaty ally of the United States as a full fledged long time member of NATO. Period. If we were to push Turkey out of NATO and into an alliance with Russia, it would catastrophically destroy the NATO alliance in the most critical region of the theater – at the intersection between Europe, Asia, and the Levant. How preposterous a proposal is this, effectively recommending the destruction of our longest and most valuable military alliance! SMH! Second,we Americans should be vastly more worried about the authoritarian regime of President Trump who continually sells out his country to the Russians and the North Koreans than about anything going on in Turkey, which is still a democratic republic and a treaty ally of the United States. Whatever Erdogan has done pales to the damage already done, and ongoing, by Trump to our national security. Even yesterday Trump preposterously launched a vicious public attack against ALL of our national security agencies because they dared to speak the truth about our actual national security risks, unmasking Trump’s repeated lies. Just the most bizarre posts…there is no doubt that Turkey is headed, if not already at becoming a Islamic theocracy. Turkey’s international relationships are both complex and yet shallow. Turkey wants to be a 21th century regional power and move towards a 7th century religion both at the same time, and while nothing is impossible…some things are less probable than others. Turkey, as a member of NATO has routinely flouted that membership and threatened other NATO members. The Turkish government alienated itself from the European Union to such a degree as to guarantee it will never be admitted to the EU. There are just too many good reasons to deny the Turks access to the F-35 and it’s technologies…let them buy Su-57’s when they become available. Agreed. Erdogan has wanted to have his cake and eat it too, for years: desiring the security of NATO without any of the responsibilities or cooperation, maintaining absolute rule without being called a dictator, moving closer to Russia without consequences, etc. Whether Turkey is an Islamic Republic or not has absolutely nothing to do with being a member in good standing of NATO. The UK is a state with an established national religion also, with its religious leader being the King or Queen of of the UK. So what. We don’t do that in the USA, where we have always separated church and state. But the UK is a good ally and so is Turkey. Turkey will not be denied the F-35. It builds the F-35. First, the only reference to Turkey leaving NATO was just that, them leaving NATO, get a grip. Second, get over your TDS, it is making you more stupid than normal. Third, the point is the F-35 can now operate in an airspace with the S-400 present but that could change dramatically is the point. Using the word safely in a war zone is inane. The only TDS is the derangement suffered by his partisan supporters who overlook the well demonstrated facts of his treason to the United States of America. Trump openly colluded with Russia, and continues to do so today, including defying the entire defense organization of the US. Delivering the F-35 to Turkey would be a big mistake. President Erdogan is a very dangerous Islamist and a dictator. He is closely allied with Iran, not NATO. He stabbed America in the back by denying access to the 4th Cav to invade Iraq during Operation Iraqi Freedom II. He sponsors Sunni terrorists. Turkey is not the same country it was during the 1980s. And finally something that nobody refers to. These airplanes will not be used against any threat of the alliance but against another member of it, Greece. F-35s and s-400 will alter the current status quo in the Aegean Sea and maybe in the whole East-Med further distabilizing it. Later on they can also use it to bomb the same kurdish populations that fought against the islamic state. Nicolas, this is a fantastic point, and one which entirely eluded me when writing this article. The optics of an autocracy using our newest strike fighter to potentially strike militia forces we view as critical to anti-Daesh efforts are hardly positive. I am mulling over writing a more detailed and longer piece on this topic in light of all the discussion it has stirred both on CIMSEC and around the Beltway. If I do, I will be sure to mention this. Thank you for the contribution! I agree my initial comment is a little bit inarticulate. Its written during morning coffee as initial reaction. Sorry for it. What I’m trying to say, all technical excuses are invalid and wrong. I believe they are created to cloud political climate but beciding not to transfer these A/Cs would be a colossal bad political move for the US. For political discussions books will not be enough and better stay in technical side.